Pet Dangers During the Holidays! All of us at CUVS wish you and your family a wonderful holiday season! Because we’re always looking out for your four-legged family members, we’d like to share some common dangers to avoid during this joyful, and sometimes chaotic, time. Although it is tempting to let everyone sample grandma’s great cooking, holiday foods are not a good idea for your pet, even in small quantities. Meals with a high fat content are one of the most common causes of pancreatitis in dogs. Pancreatitis (inflammation of the pancreas) can result in a reduced appetite, severe abdominal pain, vomiting, and in severe cases, can be life-threatening. High fat foods and abrupt changes in the diet can lead to gastrointestinal problems, such as vomiting and diarrhea. Most of us know that chocolate can be toxic to dogs; however, few know the reasons. Chocolate contains theobromine, a chemical compound of the cocoa bean which is a strong stimulant, closely related to caffeine. In large doses, theobromine and caffeine can cause excitation, cardiac arrhythmias (abnormal heart rhythm) and seizures. Dogs are particularly sensitive to the effect of theobromine and caffeine. Chocolate should be stored far from your pets’ reach, especially dark, semi-sweet, unsweetened chocolate and cocoa nibs, since these have higher concentrations of theobromine than white or milk chocolate. 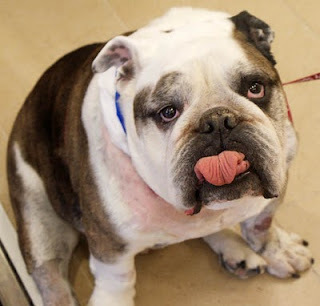 Raisins and grapes are extremely dangerous for dogs, as they can cause severe kidney failure. Keep in mind that raisins are commonly found in holiday treats such as bread and desserts. We all like to relax and enjoy the spirits of the season. Just keep in mind that even small amounts of an alcoholic beverage can significantly affect your pet. Pets, especially cats, are not as efficient at breaking-down alcohol, and could end up in an ethylic coma. Please avoid sharing your drink with Fluffy, and keep the booze out of reach at all times. If you share your house with a dog or a cat, always investigate your indoor plant choices before you consider making them an integral part of your household. Keep this in mind when receiving flowers as a gift. Poinsettia, the Christmas flower, can cause mouth irritation and gastroenteritis, but is not considered lethal. Various types of lilies, however (Easter Lily, Day Lily, Tiger Lily) can be lethal. These lilies cause severe kidney failure when ingested, even in small quantities, by your feline companion. Nothing sets the holiday mood like decking the halls and dressing your tree. However, many of these decorations can be hazardous to your pets. Tinsel and other string-like decorations can be a tempting treat for your cat or dog. Sometimes, parts of these decorations can get caught around your pets’ tongue or elsewhere in the gastrointestinal system and cause life-threatening problems that require emergency surgery. The same goes for other non-string-like decorative items, which can get lodged in the stomach or intestines, causing a blockage. Electric cords (such as for lights) can also pose a problem if your cat or dog has a tendency to chew on things they are not supposed to. Because of the danger they pose, make sure to hang your tree ornaments and other decorations out of the reach of your pets. Please keep your pets safe this holiday season. And keep an eye on them. If they are lethargic, not eating, acting abnormally or exhibiting vomiting or diarrhea – seek medical attention. Cornell University Veterinary Specialists wishes you and your family a happy and healthy Thanksgiving... and that goes for your pets as well! • Do not give in to begging pets: too many table scraps of fatty food can lead to pancreatitis. Symptoms can include vomiting, abdominal pain, diarrhea, weakness and shock- definitely not a fun way to spend Black Friday. • The turkey carcass is a delicious treasure trove of foreign bodies. The bones can become lodged in the throat or airway, or become obstructed in the intestines. Do not give the dog a bone. Close up any garbage bags and move them away from your home's living area so the animals can't get into them. • Your food is tasty and the smell will attract your pets to the table. Do not leave food unattended! Dogs and cats alike can easily get up on the table to steal food that is dangerous to them. • Overeating is bad for you, and your pets as well. Do not overfeed dogs on Thanksgiving, as this can lead to bloat. Bloat occurs when the stomach fills with gas and twists back on itself. Bloat is a life-threatening condition. • No desserts! If you own a dog, you should already know this: chocolate is toxic. Same goes for grapes, and therefore raisins. The various compounds in these foods can cause organ failure in dogs- different organs for each form of toxicity, but both should be avoided at all costs. Following the guidelines above will keep your pets safe during the holidays. We love our clients and their pets, and we hope you don't have any incidents on Thanksgiving. But if you do, the CUVS Emergency Department will be open all day and night. Dr. Kleman leads her lecture on heart failure emergencies. 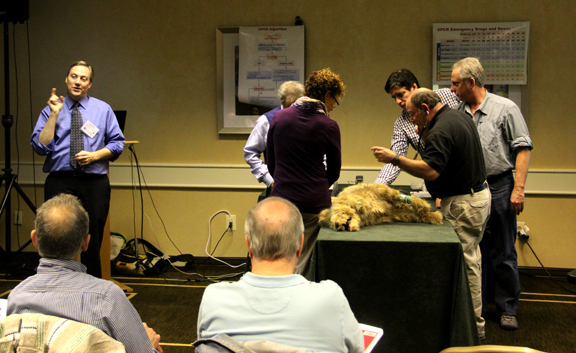 On Sunday, October 23rd, many of CUVS's specialists lectured at a one day continuing education seminar for veterinarians titled The First 24 Hours: A Multifaceted Approach To The Emergency Patient. Over one hundred veterinarians attended the six lectures which were held at the Hyatt in Old Greenwich, CT. 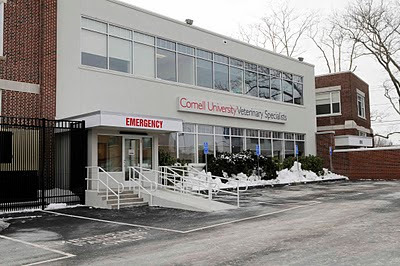 The lectures, which covered a broad range of emergency topics, were led by veterinary specialists from Cornell University Veterinary Specialists as well as the Cornell University College of Veterinary Medicine. Following the lectures were two labs which allowed veterinarians to get hands-on experience with either CPR using a virtual model or emergency radiology of the thorax and abdomen using a computer-based laboratory. Dr. Fletcher leads the CPR lab with a high-tech virtual dog model. The feedback from the attending vets was very positive and we all enjoyed meeting up with local veterinarians face-to-face. Although the veterinary field is a small community, and we do refer cases back and forth, it is not often we can meet up as a group to get to know one another. 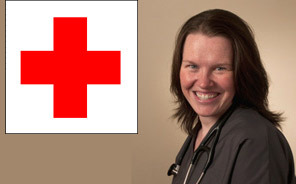 It's nice to put faces to names so that we can forge stronger bonds with our referring veterinarians moving forward. 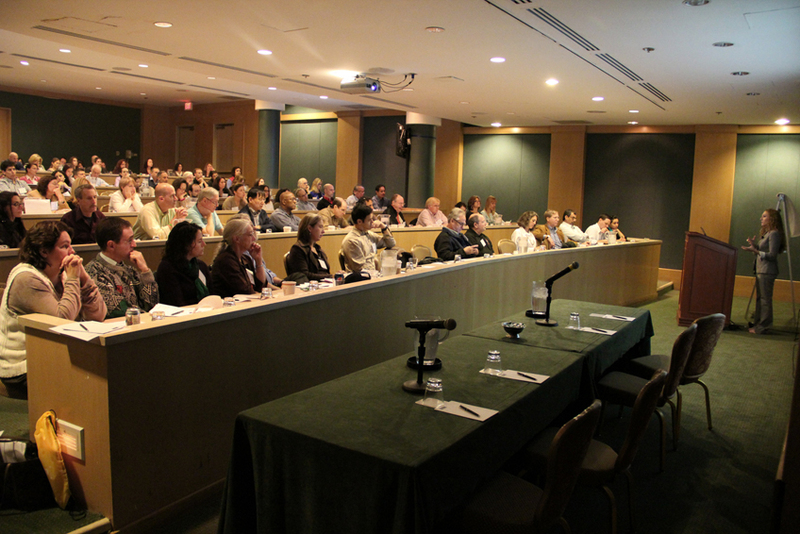 Dr. Forman lectures to a full house at his Endocrine Emergencies lecture. *Technicians welcome to the lecture portion of this program on a space available basis. Cornell University Veterinary Specialists will have doctors, technicians and staff staying at the hospital for the duration of Hurricane Irene. Care will continue around the clock for all current patients, and we have generators in place in case of a power outage. If you have an animal emergency during the worst of the storm, our Emergency Department will be open. Please call us at (203) 595-2777 to give us a heads-up as you leave for the hospital. If anything changes with the status of the hospital, we will put up another post. Keep a close eye on your pets during the storm; this type of weather is very dangerous for dogs and cats. 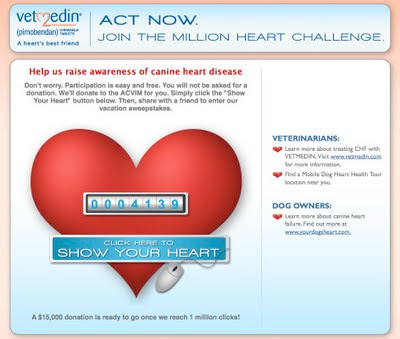 Would you like to help support research for dogs with heart disease? The American College of Veterinary Internal Medicine (ACVIM) helps support ongoing research for congenital and acquired heart disease throughout the United States and Canada. Click this link to see how you can support ACVIM's mission of enhancing animal and human health by advancing veterinary internal medicine. Canine Influenza Virus (CIV) is a respiratory virus of dogs. It has been identified in several states, including Connecticut and New York. A relatively small number of cases have been reported in Hartford, New London and Fairfield counties. Influenza virus was first identified as an infectious disease of dogs in 2004. The first isolation of the virus was done at the Animal Health Diagnostic Center at Cornell University involving racing greyhounds. Within a year of the discovery, CIV was found in pet dogs in Florida and in the New York City area. Since that time the virus has been found in different areas of the US. CIV continues to move slowly through the canine population. It is highly contagious. Risk factors for the infection are having dogs in closely confined conditions such as in boarding kennels, day care setting and animal rescue shelters. Animals being relocated from the rescue shelters seem to be a main source of the movement of the virus to new locations. How do I know if my dog has CIV? The clinical signs associated with the infection are indistinguishable from the traditionally defined “kennel cough”, now more appropriately referred to as acute respiratory disease. They include coughing, nasal discharge, fever and often inappetance. These symptoms are not unique to CIV, so it is important that the dog be thoroughly evaluated and tested. CIV infection compromises the normal defense mechanisms of the respiratory tract so that secondary bacterial infections (such as pneumonia) are common sequelae. The diagnosis of CIV necessitates the identification of the virus in the acutely infected dog (via PCR testing) or demonstrating antibodies in the later stages of the clinical event (via serologic testing). Samples for PCR testing should be taken within 4 days of onset of clinical signs and the sample of choice is a nasal swab. For serologic testing, an acute and convalescent sample (10-14 days apart) are optimal, but in areas of low CIV prevalence, a single sample taken > 7 days after acute onset may be sufficient. 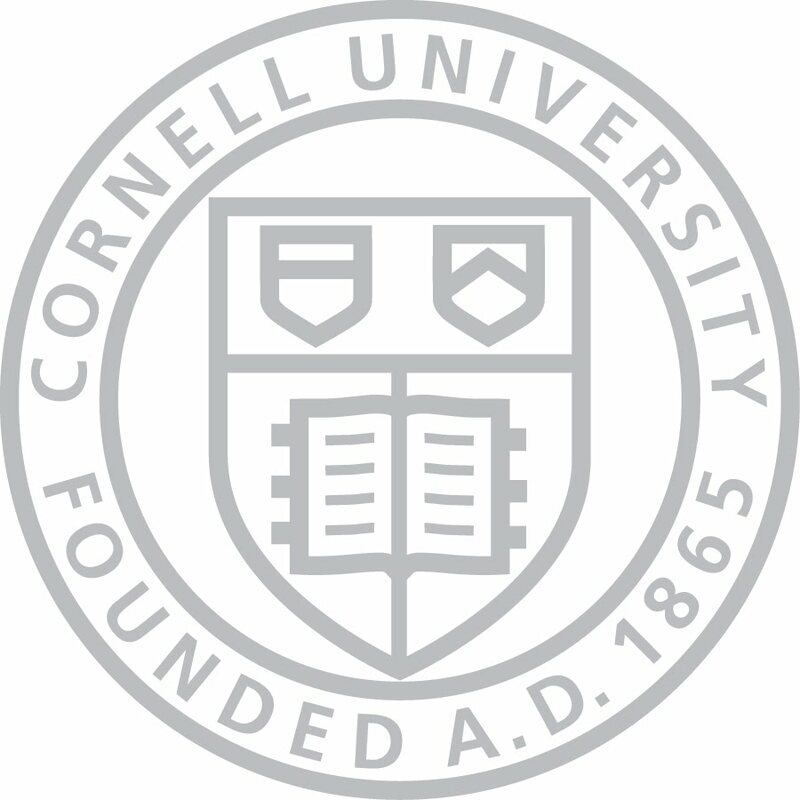 Both PCR and serologic testing are performed by The Animal Health Diagnostic Center at Cornell University. What is the prognosis for dogs with CIV? Since CIV is a relatively new (novel) disease, few dogs have natural immunity built up to protect them. As a result, a high proportion of dogs exposed to the virus become infected; approximately 80 percent develop symptoms, while another 20 percent do not become ill. Fortunately, most dogs recover within two weeks without any further health complications. However, some dogs progress to pneumonia, which is usually due to secondary bacterial infections. This is frequently curable with appropriate medical care. Dogs are generally free of CIV by 7 days post onset of clinical signs. They may cough for several weeks beyond this, but they are not contagious at this time. The risk of infection is increased by exposure to other dogs. Dog shows, dog parks, kennels, grooming salons, dog day care centers, or anywhere dogs gather increase risk of CIV infection. Risk also depends on the prevalence of the virus in the area in which the dog lives or travels. How do I prevent CIV infection? CIV is best prevented by avoiding unnecessary contact with other dogs, particularly if your dog is particularly young or old, or has a compromised immune system. A vaccine is now available, that is effective in preventing CIV-related symptoms. Should my dog be vaccinated against CIV? The vaccine should be considered for dogs whose lifestyle puts them at greater risk (see above). Due the contagiousness of this virus, some kennels and grooming salons now require this vaccination to prevent an outbreak. Aside from these situations, the decision to vaccinate should be discussed with your primary care veterinarian, taking into consideration your dog's risks and the CIV prevalence in the area in which you live or to which you will be traveling. Can humans or other pets get CIV? In spite of monitoring by the CDC, the transmission of CIV to humans or to pets has never been demonstrated scientifically. Researchers at the Animal Health Diagnostic Center of Cornell University have developed a new test to better diagnose Lyme Disease in dogs. Lyme disease is a bacterial infection of dogs and humans, caused by the bacteria Borrelia burgdorferi, and spread by ticks. According to data collected by the Center for Disease Control and Prevention, over 30,000 humans were diagnosed with Lyme disease in 2009, a prevalence that is increasing in the US. The vast majority (95%) of Lyme Disease cases occurred in just 12 states, mostly in the Northeast. Although similar information is not available for dogs, we know that many dogs are exposed to the infection, and that the geographic prevalence is similar to that seen in humans. The ability to distinguish natural infection from antibodies that occur in response to vaccination. Sensitivity to detect early infection. The Lyme Multiplex Test can detect antibodies within 2-3 weeks following infection, whereas other tests only detect antibodies 4-6 weeks post-infection. The ability to distinguish recent from chronic infection. The Multiplex Test is now available at Cornell University Veterinary Specialists, and a growing number of veterinary practices. Additional information can be found here. CUVS internist Dr. Marnin Forman and surgeon Dr. Alon Kramer, with host Lauren Collier, discuss the benefits of minimally invasive procedures on a recent episode of "Pet Talk." Lucky is a young male mixed-breed dog who was rescued in Los Angeles. The aptly named Lucky found his way into the capable and loving care of Eric Bellows, formerly of Rescue Ink. His most pressing issues at that time were gunshot wounds to his legs. These wounds required multiple treatments, but Lucky persevered bravely through his procedures and was fostered by Eric, whose current rescue organization is called Pack Ethic. However, Lucky's health issues were not yet behind him. 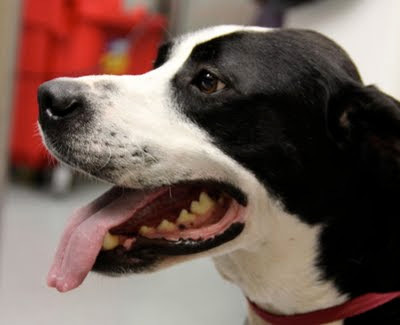 In February, Lucky tested positive for heartworm. In late March, Lucky was brought in for a consultation with cardiologist Dr. Mandi Kleman, DVM, DACVIM, who used a variety of tests including bloodwork, thoracic radiographs (seen below) and an echocardiogram to confirm the diagnosis of heartworms in the pulmonary artery. It is not uncommon for cardiologists to perform heartworm extraction, and the procedure is the only good option for dogs that have heartworms truly within the heart (i.e. caval syndrome). It is a much more common procedure in southern states where heartworms are more prevalent. 2-view thoracic radiographs showing an enlarged heart due to heartworm infestation. The extraction of heartworms from the pulmonary artery is not as common as extraction from the heart, but it is still a great option and sometimes the best option for dogs (like Lucky) with a very large worm burden, or dogs that are having problems like syncope, collapse, bad coughing, tachypnea, etc. Lucky was a quiet dog with an intermittent fast respiratory rate and coughing, but luckily for him he had been strictly rested due to the extensive orthopedic disease which resulted from his gunshot wounds. If Lucky had been able to exercise more and increase his heartrate, he would have suffered more symptoms from inflammation due to the heartworm infestation. Within a few weeks of Lucky's first visit to CUVS, a generous benefactor volunteered to pay for his heartworm extraction surgery. 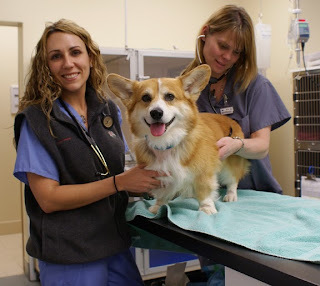 To prepare Lucky for his surgery, Dr. Kleman prescribed 4 weeks of doxycycline, plus a short, tapered dose of steroids to be given just prior to surgery, and in mid-April Eric brought Lucky in to CUVS for the extraction. 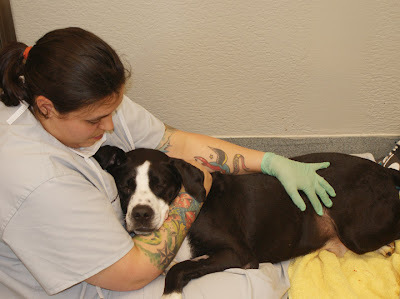 Just before administering anesthesia, the CUVS surgical team gave Lucky a dose of benadryl and dexamethasone. All of these drug therapies worked to decrease inflammation in Lucky's lungs, decrease his coughing, and decrease his risk of clinical signs associated with pulmonary thromboembolism. 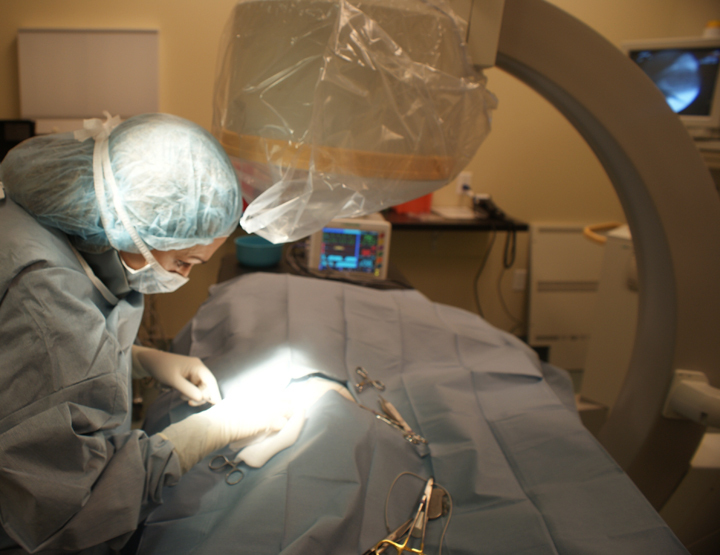 As heartworm extraction surgery is executed using fluoroscopy and tiny incisions, Dr. Kleman's first step in the surgical suite is to create a small incision in Lucky's neck to dissect down to the jugular vein. This incision becomes the entry point for the surgical tools that are fed down into the patient's heart- in this case, the pulmonary artery on the right side of the heart. Dr. Kleman uses a specialized guiding introducer to position a snare catheter in Lucky's pulmonary artery. 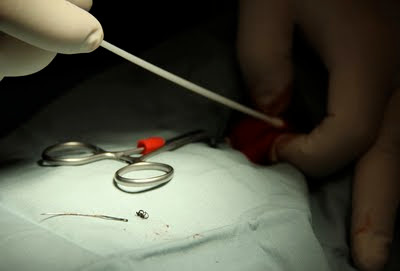 The snare catheter catches the worms, which Dr. Kleman grabs with specialized forceps called Ishiharas. The entire surgery is coordinated through fluoroscopy, which is essentially real-time radiographic imaging of the procedure. Heartworms extracted from Lucky's pulmonary artery. As can be seen in the picture above, taken during Lucky's surgery, his heartworm infestation was severe, with many large adult worms present in the pulmonary artery. Without direct surgical intervention by a specialized team, Lucky would have most likely died from complications of his heartworm infestation. 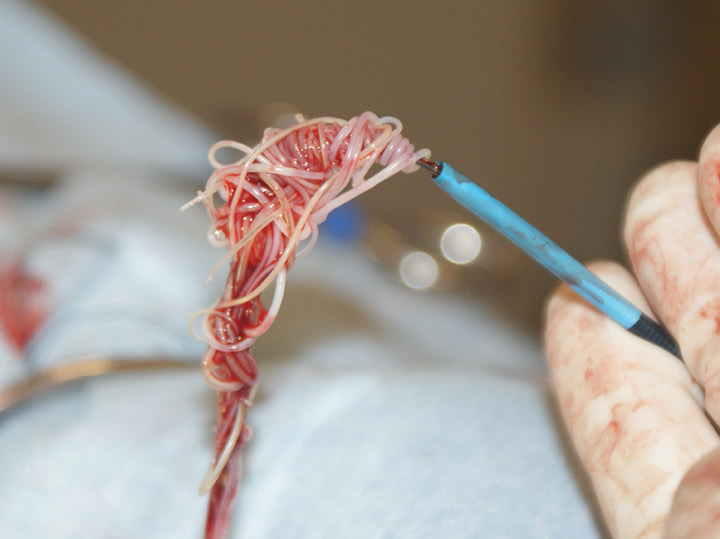 Heartworm extraction surgery is a complex procedure which is not without risks: anesthesia in particular poses an additional risk in these cases due to the compromised heart function. Additionally, if the heartworms themselves are lacerated during the course of the procedure, a dangerous anaphylactic reaction can occur. 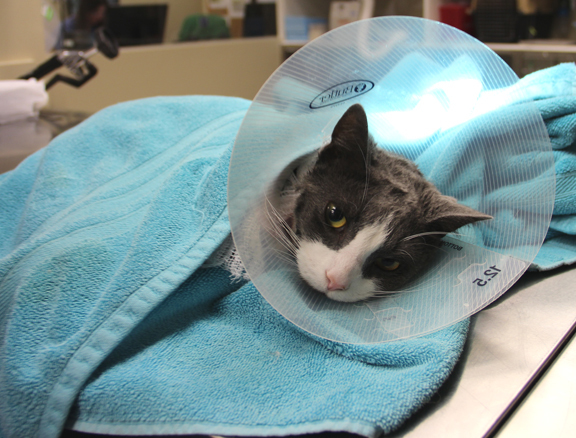 Thankfully, with Dr. Kleman's expert care and steady hand, Lucky's surgery was uneventful. 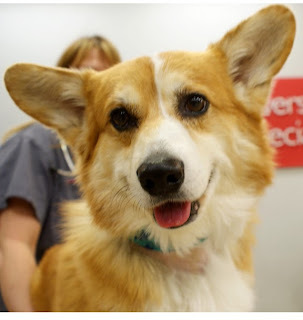 In fact, when Dr. Kleman removed the mass of heartworms from Lucky's pulmonary artery, his SpO2 value (the oxygen saturation level in his blood) jumped from 92% to 99%, indicating that his heart function immediately improved. 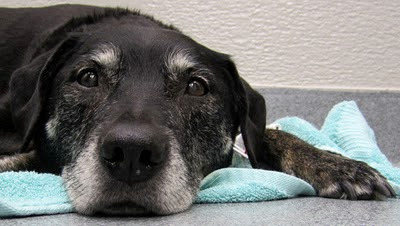 Lucky recovers in the ICU after his heartworm extraction procedure. 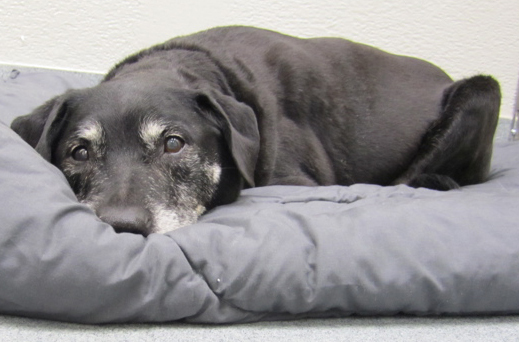 After surgery, Lucky stayed at CUVS overnight for monitoring and pain management. The following day, Lucky went home with Eric to rejoin their pack. Lucky and Eric returned to CUVS about two weeks later to continue Lucky's heartworm treatment with an anti-heartworm drug called immiticide. The battle against heartworms is a long one: due to the nature of the worm's life cycle, adult worms give birth to live young called "microfilaria" which circulate in the blood stream. In order to make sure Lucky remains heartworm-free, immiticide is administered in two doses, six weeks apart, to kill the microfilaria. 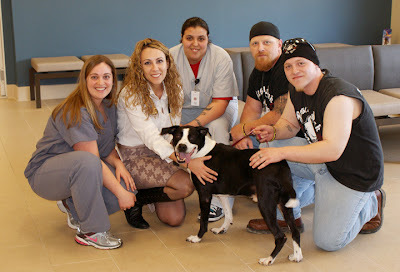 Lucky at discharge with staff and family after heartworm extraction. Heartworm is an easily preventable condition: there are many heartworm preventatives on the market which are available through your family veterinarian. These preventatives are available in the form of chewable tablets or topical liquids, both of which make administering them to your pet very easy. As the saying goes: an ounce of prevention is worth a pound of cure. Please make regular visits to your veterinarian so that heartworm disease is prevented. 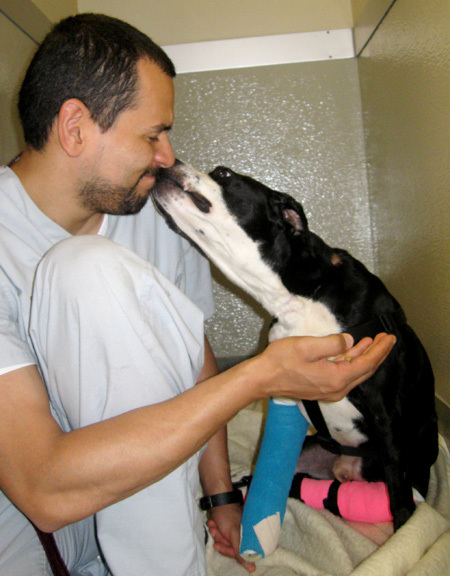 Lucky during his post-operative stay at CUVS, before his orthopedic surgery. Lucky's long journey to recovery was not yet over after the heartworm treatment. Lucky's generous benefactor agreed to fund the rest of his treatment for his lameness, which stemmed from gunshot wounds and abuse. During his two month recovery from the heartworm surgery, Lucky was fostered by CUVS employees and their families until he was strong enough to go back into surgery. Lucky's right front and left rear legs were both painfully and chronically luxated, or dislocated, due to his previous injuries (see picture below). To remedy this, Dr. Alon Kramer DVM, DACVS, recently performed a procedure to implant plates into each leg which will allow stabilization and fusion of the affected joints (on both legs, it was the lower joints which were affected). Lucky when first rescued. Notice lameness in rear leg and wounds on front leg. While these procedures sound straightforward, due to lucky’s chronic injuries they were complex and challenging. 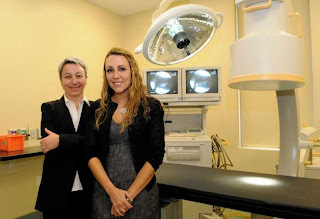 Dr. Kramer stabilized both limbs in one long operative procedure. On each limb, he needed to dissect the site to allow re-alignment of the chronically dislocated joints, excise and remove the lining of the joints, pull tendons aside, rigidly stabilize the joint and associated bones and insert bone grafts. Dr. Kramer affixed custom-shaped arthrodesis plates to the joints with specialized screws. The grafts will permit the bones to fuse together to fix each of the affected joints in place. The joints will no longer move, but even so, they will become more useful and functional for Lucky and allow him to use each leg again. Finally, after closing the surgical sites and bandaging the legs, Lucky got two prefabricated splints to stabilize the surgery sites during recovery. Lucky in recovery after his orthopedic surgery. The remainder of Lucky's journey, which is ongoing at the time of this post, involves six to eight weeks of rest, bandage changes, pain medications and a lot of love showered upon him by employees of CUVS. At about eight weeks, Lucky will have follow-up radiographs which will show Dr. Kramer the progress of Lucky's healing. 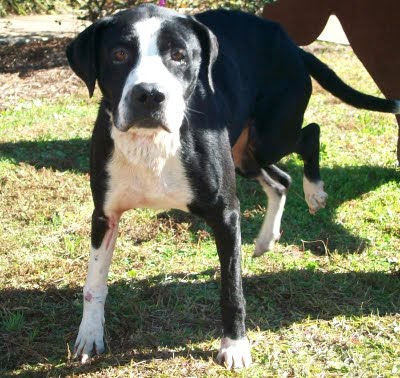 Lucky is indeed an extremely lucky dog: not only was he rescued, but he was cured of his serious heartworm infestation and his orthopedic injuries with the advanced science available only at a world-class animal hospital. 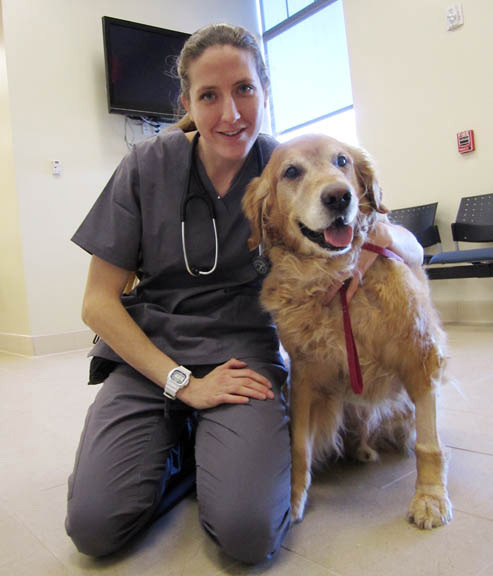 Lucky's journey required the care and love of an entire community of animal lovers: from Eric and the animal rescuers he works with, to Lucky's amazing benefactor, to the caring employees of Cornell University Veterinary Specialists. 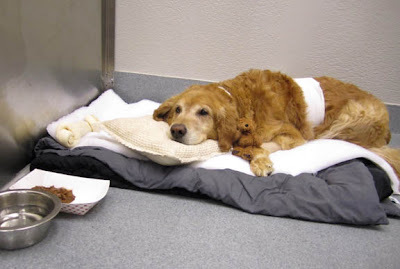 All generously gave their kindness, skill, care and love to this dog who needed it so badly. And after a life which started off with so much pain and abuse, Lucky has finally found happiness in his forever home with a CUVS employee. A Dog-Centered Scavenger Hunt and Free Family Picnic to Benefit the Riedel and Cody Fund. 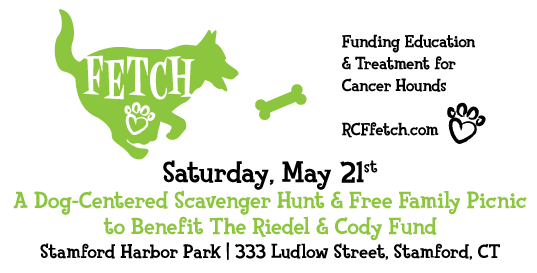 FETCH stands for Funding Education and Treatment of Cancer Hounds, an event organized to benefit the Reidel & Cody Fund. Fairfield County families and pet owners (with their dogs) are invited to participate in a scavenger hunt organized by FETCH to benefit dogs with cancer. Starting at 9AM, participants will receive clues either electronically or at the event site, answer questions, complete tasks and collect clue items by traveling around Fairfield county by car, motorcycle or bicycle. At 12:30PM, participants are to return to Stamford Harbor Park to turn in answer, items and activity stamps collected over the course of the morning. The award ceremony will be held at 1:30PM. There will be games, activities and a concert for people of all ages. The first 100 participants to register will receive a free swag bag. The requested donation per participant or vehicle will be $25. To register, donate or get more details, go to RCFfetch.com or call (203) 295-0355. CUVS is proud to not only sponsor this event, but to provide an Emergency Care Station to take care of any pet emergencies. The station will be staffed by one of our own veterinarians, technicians and staff members. Little Dogs with Big Hearts: What Does this Mean for My Pet? On Sunday, May 15, at 2-3:30 PM, Dr. Mandi Kleman, DVM, DACVIM, will lead a free lecture in the auditorium at Cornell University Veterinary Specialists animal hospital at 880 Canal Street in Stamford, CT. The topic of this lecture will be heart disease in dogs and it will serve as an overview of Mitral Valve Disease for dog owners. Dr. Kleman will briefly outline the disease process, the diagnosis, the possible symptoms, and how to care for a pet with Mitral Valve Disease. Heart disease is not just an ‘old dog’ disease and certain breeds are more prone to it than others. 50% of our beloved small breed dogs over the age of 10 have heart disease. Valvular heart disease can be compared to the slow aging process of joints, which may result in arthritis. In small breed dogs, the valves within the heart can also degenerate with age. As these valves become more abnormal, blood begins to flow backwards within the heart and results in a heart murmur. Cornell University Veterinary Specialists is proud to provide pet health educational sessions for owners. If you are interested in attending any of these classes or learning more about our pet health educational sessions, please call us at 203-595-2777 or email us at info@cuvs.org. Space is limited and reservations are required for attendance. All classes are held at CUVS. Please check back often for session updates. Rookie waking up from anesthesia. Rookie is a 2-year-old male domestic shorthair cat who was recently admitted to CUVS. Rookie's owner noticed a couple things that spurred her to bring Rookie in: he had started acting differently and dry heaving occasionally without bringing anything up. He was eating and drinking less than normal and his bowel movements were infrequent. As an indoor cat, Rookie normally doesn't get into much trouble (besides finding hair ties on the floor and batting them around). However, his owner also noticed a lump that had formed under Rookie's jawline, and at that point she decided to bring Rookie to CUVS. Close-up view (inset) of the end of the needle (with black thread) embedded in Rookie's throat. Click to enlarge image. Rookie was seen by emergency veterinarian Dr. Michael McCann, DVM, who performed a physical exam and found that Rookie had an elevated temperature, and that the composition of the submandibular mass was abnormal. Palpation of the mass revealed the suspected presence of a hard object within the swelling. 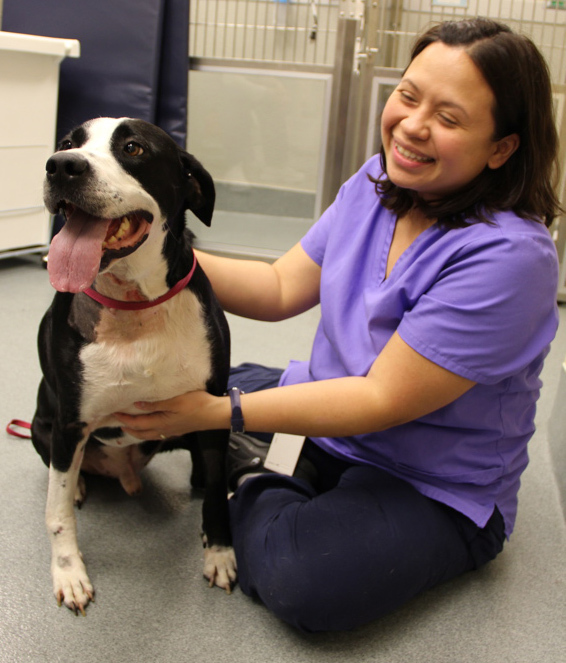 Together, Dr. McCann and Dr. Melissa McDaniel, DVM, MPH, performed an exam of Rookie's mouth and throat. A sharp metal object was seen protruding from the right ventral oropharyngeal region, just caudal to the back of the tongue (behind the tongue, protruding from the bottom right side of the wall of the throat). Two radiographic views showing the location of the foreign body. Dr. McCann ordered two radiographs of the neck and head. A linear metal object of uniform thickness from end to end was visualized adjacent to the mandible. Rookie was then intubated and prepared for surgery to remove the foreign object. A hemostat was clamped onto the foreign object from within the oropharynx to prevent accidental loss of the object into the mouth upon removal. An incision was made in the skin just over the top of the mandible, not only to easily remove the foreign object, but to allow the wound to drain afterward. The incision revealed the foreign object to be a sewing needle with a few millimeters of thread still attached. The needle and thread were removed, along with some purulent debris (commonly called pus). The wound was cultured and sent out to the lab for analysis, and it was thoroughly irrigated with sterile saline. The surgery went very well and Rookie recovered uneventfully. Rookie spent the night at CUVS to continue to receive supportive care, pain medication and antibiotics. The next morning he was discharged back into the care of his observant and concerned owner with more antibiotics and pain medication. Close-up of the needle and thread removed from Rookie's throat. 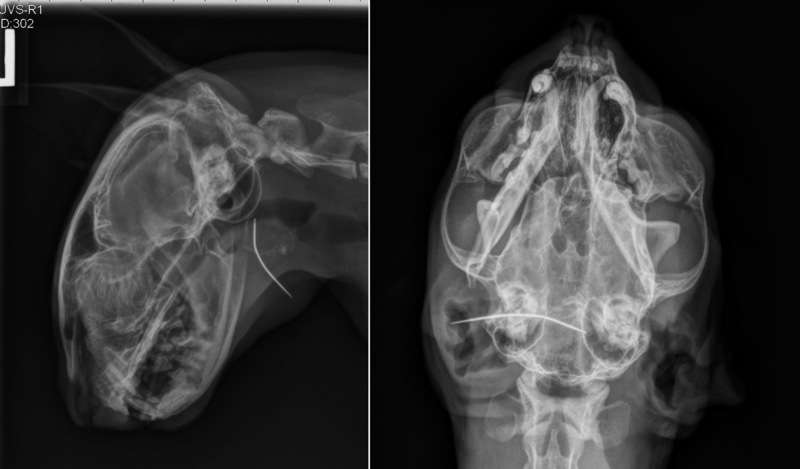 While the above case sounds fairly simple and uneventful, it should be noted that this particular cat was very lucky: lucky to have an attentive owner, lucky to be seen quickly at a high-tech animal hospital, and lucky that he did not sustain more serious injuries from ingesting the needle. This is a great reminder to all of us: cats and dogs frequently play with and explore objects with their mouths. This is a natural behavior that can lead to big trouble if they find something dangerous. We should all take the time to pick up and put away anything potentially harmful to our pets so we can keep them safe. Do you know what to do if your pet has been hit by a car, suffers from heat stroke or gets stung by a bee? This class is designed to teach you the basics of first aid and Cardiopulmonary Cerebral Resuscitation (CPCR formerly known as CPR) for your pet. You will learn everything from at-home splints/bandages to chest compressions so that you can be the first responder for your pet. Zolty is an amazingly sweet 9-year-old Golden Retriever who was born on Valentine's Day in 2002. Zolty's owners recently noticed an acute onset of extreme weakness, prompting them to take Zolty to see Dr. Nolan Zeide, their regular vet at Bull's Head Pet Hospital. After a thorough examination, Dr. Zeide found that Zolty suffered from pericardial effusion and a condition called cardiac tamponade. In layman's terms, pericardial effusion is the accumulation of excess fluid around the heart. Cardiac tamponade is the compression of the heart that occurs when blood or fluid builds up between the heart and the outer covering of the heart. 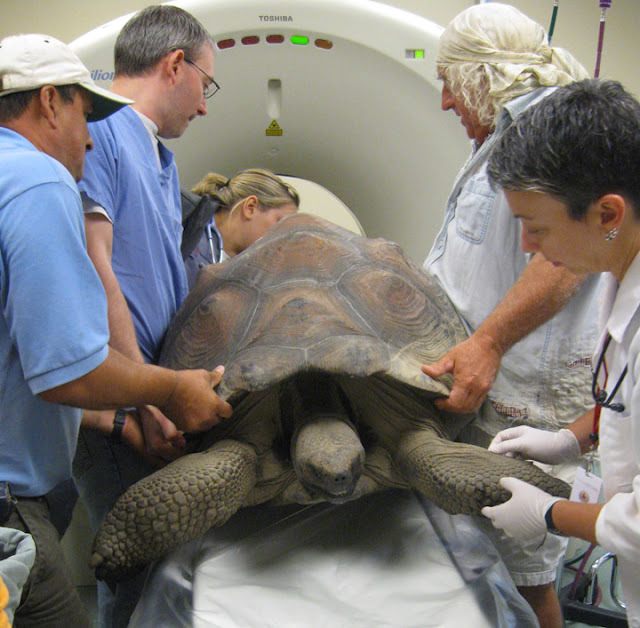 Dr. Zeide referred Zolty to Cornell University Veterinary Specialists for further evaluation and treatment. 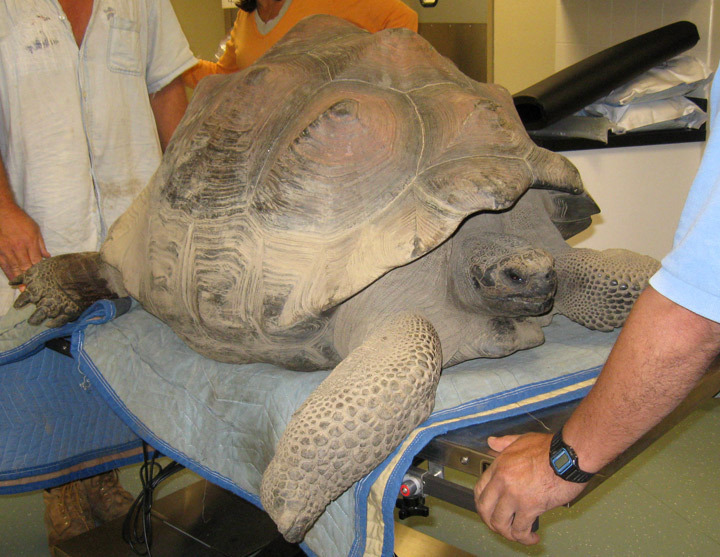 When Zolty arrived at CUVS, he was extremely weak with a fast heart rate and weak pulses. His heart sounds were barely audible with a stethoscope. One of the first diagnostic tests run on Zolty at CUVS was an echocardiogram, which confirmed Dr. Zeide's findings of pericardial effusion and cardiac tamponade. Additionally, a mass was located on the right side of Zolty's heart. In order to alleviate the stress created by fluid buildup on the outside of Zolty's heart, criticalist Dr. Sergi Serrano, LV, DVM, DECC performed an ultrasound-guided pericardiocentesis. In other words, Dr. Serrano used ultrasound as a means of guidance to insert a needle into the sac surrounding Zolty's heart and remove the excess fluid that was trapped there. After Dr. Serrano removed 100mls of fluid, Zolty's tampanade resolved on its own and his heartrate returned to normal. While this remarkable turnaround sounds exciting, it was simply a temporary fix for the symptoms associated with a larger problem: the mass on Zolty's heart. It should be noted that Zolty still had arrhythmias, or abnormal electrical patterns within his heart, and that the fluid would have continued to fill up within the outer covering surrounding Zolty's heart if no further action was taken. After a consultation with Dr. Serrano, Zolty's owners decided that they wanted to have the mass removed from Zolty's heart. A second consultation with Dr. Mandi Kleman, DVM, DACVIM (Cardiology) involved more detailed and extensive analysis of Zolty’s heart and the mass. Using echocardiogram, Dr. Kleman found that the pumping function of Zolty's heart was moderately depressed. Additionally, she described the location, size, and appearance of the mass within the edge of the right atrium. Based on these findings, she suspected to be a malignant type of cancer called hemangiosarcoma. Zolty's large run allowed him to stretch out and relax post-surgery. 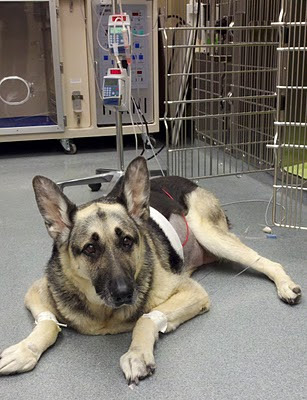 After the values of a full blood test were found to be favorable, and no metastatic disease was discovered on abdominal ultrasound, Dr. Alon Kramer, DVM , DACVS scrubbed in to perform Zolty's heart surgery. Zolty’s surgery involved a thoracotomy (open chest surgery) to allow exposure, and careful excision of his heart’s right atrial mass. Dr. Kramer also removed part of Zolty’s pericardial sac (the outer covering of the heart) to prevent any future fluid accumulation. The surgery went very well, despite being a technically difficult procedure. Zolty recovered recovered uneventfully and was comfortable in our ICU shortly afterwards. 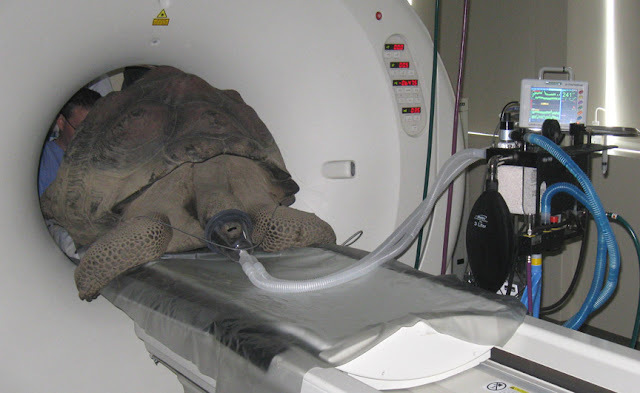 After the surgery, the mass was sent out to the lab for a histopathology and analysis. Zolty relaxes in his run in ICU while we monitor his heart functions post-surgery. Zolty stayed in the ICU for four days after surgery for close monitoring and pain and arrhythmia management, during which time he successfully won over every single employee that participated in his care. After his stay in ICU was over, Zolty was discharged to his owners with a Holter Monitor, which is an ambulatory device that measures heart rate and rhythm for 24 hours. The beauty of these devices is that they can be worn by the patient while resting in the comfort of their home. 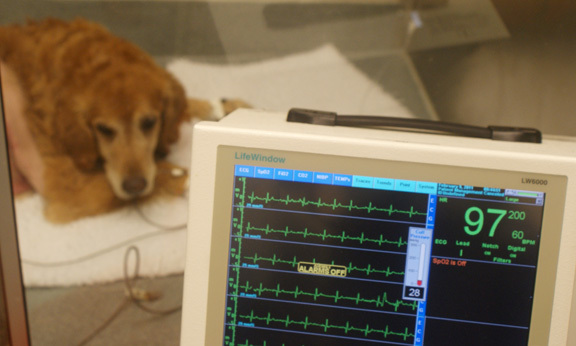 The dog can relax while the Holter monitor acts like a portable ECG, recording information about the heart that can be downloaded later for analysis. Heart rhythm abnormalities can vary from hour to hour, so without a portable device like the Holter monitor, the animal could experience abnormalities while away from the animal clinic that would otherwise be missed by the doctor. Zolty stayed at home resting for 24 hours while wearing the Holter monitor, and then he was brought back to CUVS to have the monitor removed. The data was then downloaded and analyzed. We were all pleased to find that the Holter monitor showed no evidence of concerning arrhythmias post-surgery. The histopathology report on the heart mass did reveal cells consistent with hemangiosarcoma, confirming Dr. Serrano and Dr. Kleman’s pre-surgical suspicions. Hemangiosarcoma is a form of malignant cancer. Zolty is currently being seen by CUVS oncologist Dr. Edwin Brodsky, DVM, DACVIM (Oncology) who has begun treating him with chemotherapy. 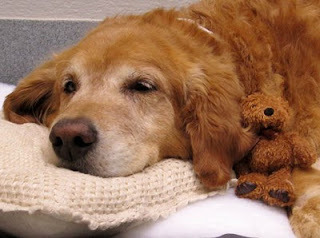 Chemotherapy does not usually make animals feel ill like it can do to humans. The use of chemotherapy in animals is not meant to absolutely cure the cancer; rather, it is a way to prolong a good quality of life. 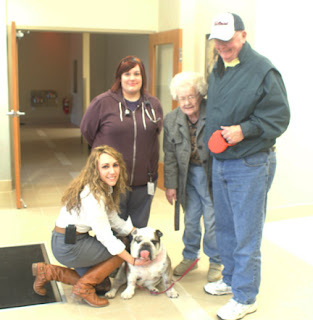 As such, we are very happy that we were able to give this wonderful dog more time with his owners. Zolty is an amazing animal who deserves to live a comfortable life, and we all feel blessed to be able to help with that. Our own Dr. Mandi Kleman, DVM, DACVIM (Cardiology) and Dr. Susan Hackner, BVSc, MRCVS, DACVIM (Internal Medicine), DACVECC (and CMO of Cornell University Veterinary Specialists) participated in the most recent Inside Cornell event in New York City. 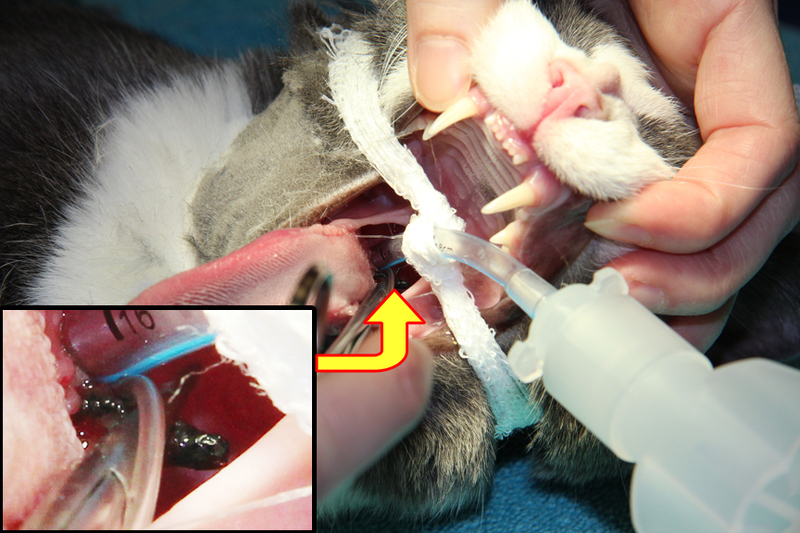 Dr. Kleman discussed treating subaortic stenosis (SAS) in pets utilizing novel balloon valvuloplasty with cutting balloons and high-pressure balloons. 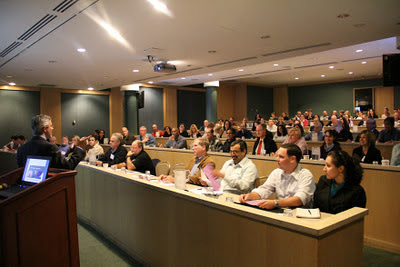 The video can also be viewed on Cornell's website, and the Inside Cornell event is discussed on the CU in the City blog. Scottie is a very special male 7-year-old Pembroke Welsh Corgi who has previously enjoyed Championships in multiple US and Canadian dog shows. 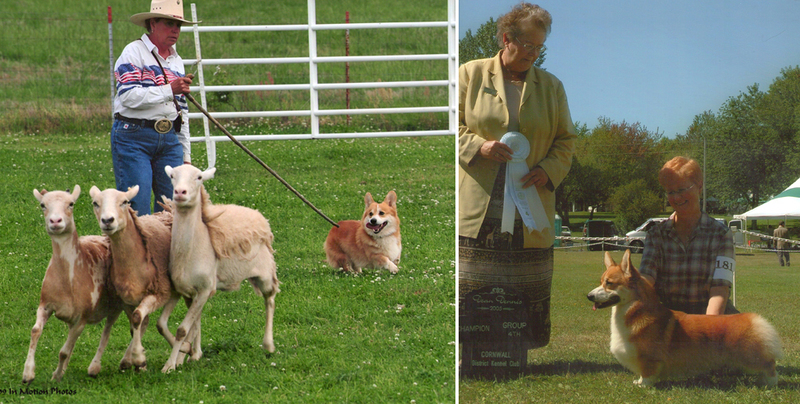 He has also received titles for herding ducks and sheep. Unfortunately, Scottie's owner, Mari Carroll, noticed over the past few weeks that he had become exercise intolerant and less interested in playing with the other dogs in the household. Scottie was brought to his regular vet for an exam. While at the vet's office, he suffered four fainting episodes (syncope). The results of an electrocardiogram (ECG) were cause for concern and Scottie's veterinarian immediately referred him to the Emergency and Critical Care service of Cornell University Veterinary Specialists (CUVS) for a consultation with cardiologist Dr. Mandi Kleman, DVM, DACVIM (Cardiology). Upon arriving at CUVS, Scottie experienced another episode of fainting and collapse, and he was immediately brought into the Emergency service for stabilization under the care of Dr. Sergi Serrano, LV, DVM, DACVECC. A repeat ECG showed complete heart block. After discussing all of the options with the owners, Dr. Serrano admitted Scottie for a diagnostic workup with the intention of Dr. Kleman implanting a pacemaker. Scottie's initial diagnostic workup included bloodwork, a urinalysis and an echocardiogram. 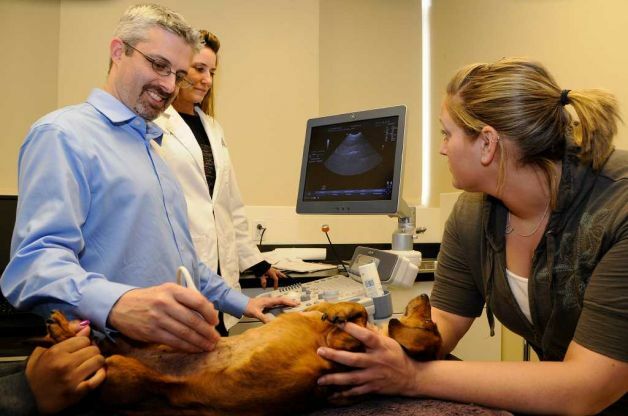 Due to the additional findings during Scottie's physical exam, an abdominal ultrasound was performed by CUVS board certified internist Dr. Forman DVM, DACVIM (Internal Medicine) prior to pacemaker implantation. Dr. Kleman implanting Scottie's pacemaker. At this point, Scottie was a good candidate for emergency pacemaker implantation, and Dr. Kleman was prepared for the procedure. The 75-minute implantation procedure went smoothly and Scottie was kept overnight for post-surgical monitoring. The next day, Dr. Kleman performed a chest x-ray, another ECG, and programmed the pacemaker to optimize the settings. 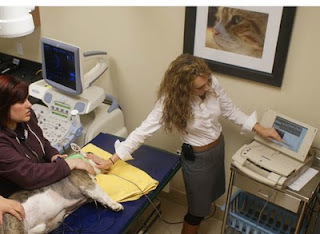 Programming the pacemaker, as well as periodic evaluations of the pacemaker's function, can be achieved with no sedation and absolutely no discomfort for the animal. Scottie laid down on a bed in ICU and enjoyed a head scratching (care of our technicians) as Dr. Kleman programmed the pacemaker with her laptop computer and a remote control. Scottie's x-ray (radiograph) taken the day after surgery showing the pacemaker's location. It should be noted that the total amount of time that elapsed between Scottie's arrival at CUVS and the end of Dr. Kleman's pacemaker implantation procedure was only about 7 hours- a testament to the speed, accuracy and flexibility that is only possible at a state-of-the-art animal hospital such as CUVS. Dr. Kleman, DVM, DACVIM (Cardiology) and Nicole VanSant, BS, LVT, VTS (ECC) examine Scottie the day after his pacemaker implantation. 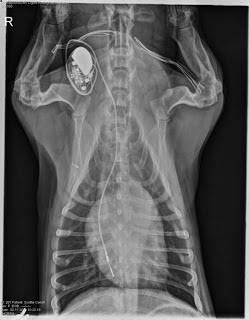 “Pacemaker implantation in dogs and cats is not uncommon. 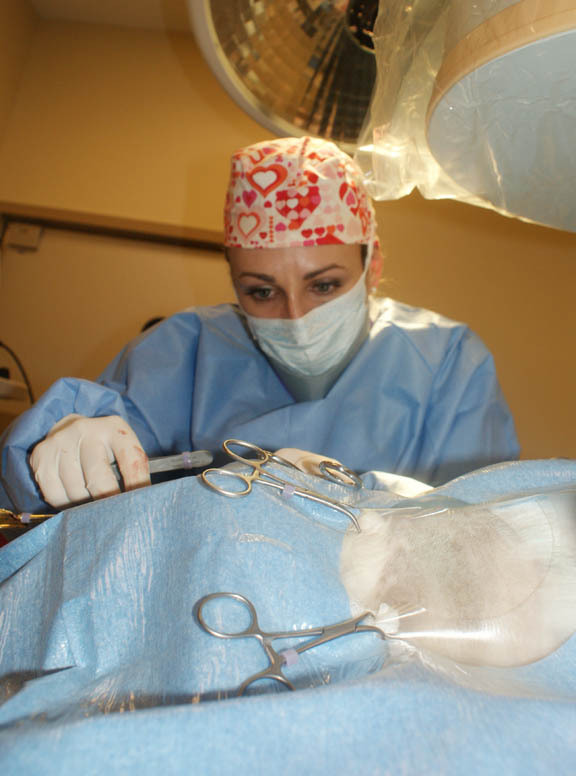 Hundreds of pacemakers are implanted in the U.S. each year by veterinary cardiologists,” says Dr. Kleman. “Pacemaker implantation in dogs and cats is also not as expensive as one might think.” The cost of the procedure is comparable to an orthopedic surgery on a dog’s knee or back. Additionally, the procedure is minimally invasive, with the pacemaker implanted through a superficial vein. Scottie, bright, alert and happy the day after his pacemaker implantation. The patient recovers from the procedure with instant clinical improvement. The heart rate is restored to normal and the heart can provide enough oxygen-rich blood to the pet's body. The rechecks are not difficult for the pet or the owner. It can be expected that the typical pacemaker only needs to be programmed two to three times in the first year, and once per year after that. Please click on the image above to see an enlarged version. We were thrilled that we could provide the necessary care to another dog with complete heart block. Scottie was a remarkable patient and our affection for him was trumped only by the joy on Mari's face as he was discharged from CUVS the following day. 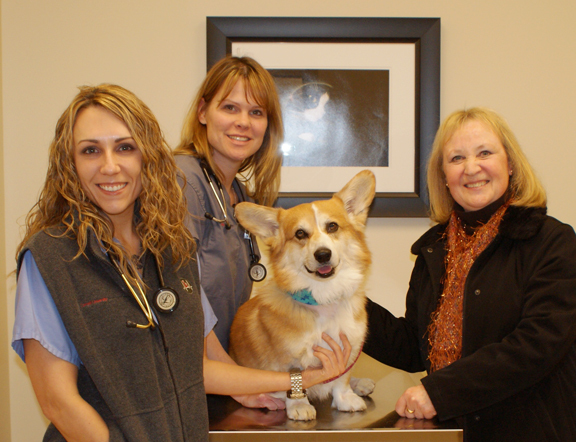 Dr. Kleman, DVM, DACVIM (Cardiology) Nicole VanSant, BS, LVT, VTS (ECC), Scottie & Scottie's mom Mari at discharge. Nicole, Dr. Kleman, Scottie & Scottie's mom Mari at discharge. To learn more about pacemakers, click here. This past week we saw a couple cases of ibuprofen toxicity in dogs- one was an intentional dosing of the dog by the owner, and the other was a case of the dog finding the bottle of pills and ingesting them. While these are two very different situations, the end result is the same: two very sick animals. Cats and dogs that ingest ibuprofen (the active ingredient in Advil), acetaminophen (Tylenol) or aspirin experience a wide range of negative effects such as severe vomiting, gastric ulcers, kidney failure, liver failure and, if the animal is not treated medically, death. The dog we treated that accidentally ingested the ibuprofen pills arrived at CUVS comatose, with constricted pupils. She was unresponsive but trembling. Our team sprang into action by administering fluids and the appropriate drugs, placing a nasogastric tube, suctioning her stomach and giving her charcoal and gastroprotectants. Her blood values were closely monitored overnight and by the morning she was awake and aware, although she did stay in the intensive care unit for three more days. Despite the severity of this case, both dog and owner are very lucky: the attentive owner figured out something was wrong and rushed his dog to the vet. This quick thinking saved the dog's life. #1: Make absolutely sure that all of your pills at home are locked away securely. #2: Do not give any pills to your dog or cat without seeing your vet first. We all know that dogs like to jump up and see what's on the counter or table, and cats have a truly remarkable ability to jump onto the highest shelves. A bottle of pills left out on a flat surface is a tempting target for both dogs and cats. If you feel like your pet is in pain, always bring her in to see your vet. The vet will advise you on the proper care for whatever is causing the pain, and you can be certain that the prescription he writes for you will be safe. Here is the rule of thumb we'd like you remember: dogs and cats cannot take the same pain relieving pills as humans. Casey is a mixed-breed spayed female dog owned by Suzanne, who is the Senior Client Service Representative at Bull's Head Pet Hospital. Casey was referred to CUVS from Bull’s Head after Dr. Nolan Zeide diagnosed her with a large abdominal mass, hemo-abdomen and a fever. Casey was admitted to CUVS for observation, supportive care and a further work up under the care of Dr. Rousseau, DVM, DACVIM, DACVECC. An ultrasound at CUVS revealed a large mass potentially originating from the liver, an abnormal spleen and a probable left adrenal mass. Casey underwent abdominal exploratory surgery with Dr. Alon Kramer, DVM, DACVS, during which a large, ruptured splenic mass and a ruptured liver mass were found. 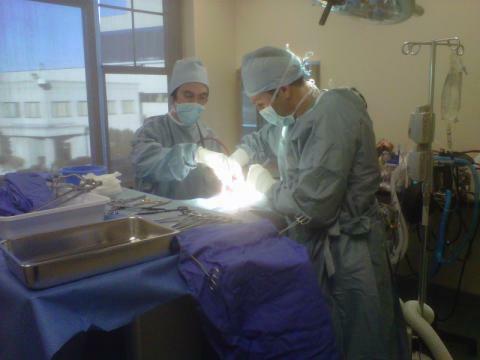 A splenectomy, a liver lobectomy and an adrenal biopsy were performed. (Her spleen and part of her liver were removed.) Casey also received a blood transfusion during surgery, a routine part of splenectomies as it combats anemia. 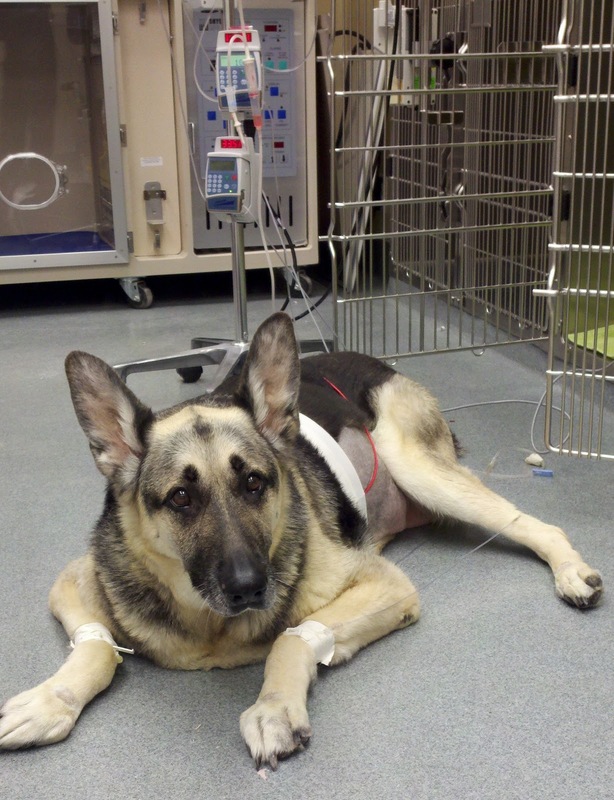 Post surgery, Casey stayed in our ICU for four days for pain relief and continuous monitoring. Attentive post-surgical monitoring is important for splenectomy patients to make sure that there are no complications. Lab results came back showing liposarcoma of the intermediate grade in the spleen, hepatoma in the liver and suspected pheochromocytoma in the adrenal gland. Once Casey was stable enough for travel, she was sent back to Bull’s Head so her regular veterinarian could continue caring for her. Casey was a lovely patient for us and although we are happy she was discharged from CUVS, we were sad to see her go! Dr. Susan Hackner (CMO) and Dr. Mandi Kleman (Cardiology) are interviewed by Lauren Collier on Channel 12 CT's "Pet Talk" TV show about the opening of Cornell University Veterinary Specialists. 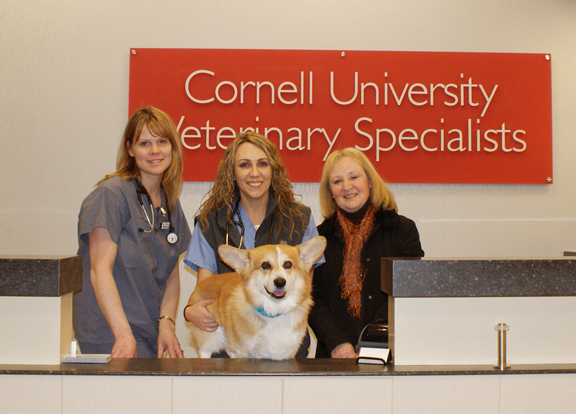 Lipton was Cornell University Veterinary Specialists' first emergency case on January 14th, 2011. She was referred to us by a local veternarian because she was lethargic and had collapsed on more than one occasion. Upon examination, our criticalist Dr. Sergi Serrano, LV, DVM, DACVECC, suspected a possible hemoabdomen (blood in the abdominal cavity). Our team began stabilizing Lipton and performing diagnostic tests, which included bloodwork, abdominal ultrasound, thoracic radiographs and echocardiography. These tests confirmed the hemoabdomen and Lipton was rushed into surgery with Dr. Alon Kramer, DVM, DACVS. Exploratory surgery revealed multiple splenic masses, one of which had ruptured and was actively bleeding. Dr. Kramer performed a splenectomy (removal of the spleen) and Lipton was then admitted to ICU for recovery and monitoring. Lipton stayed in our ICU for three days, during which she received a blood transfusion to treat her anemia. Attentive pain management and lots of love from our staff made Lipton's extended stay at CUVS as comfortable as possible. Check out this great article in the Stamford Advocate which covers CUVS, the services we offer, our high-tech equipment and skilled staff! 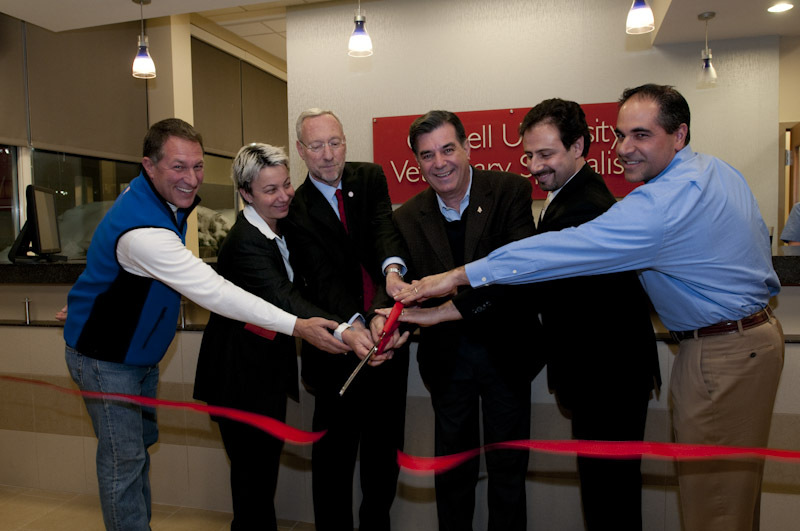 We are proud to announce that Cornell University Veterinary Specialists is now open and currently treating patients at a brand-new facility in Stamford, CT. CUVS opened its doors on January 14th! A crowded ribbon-cutting event was held during the final open house on January 12th, 2011. The ceremony was attended by the mayor of Stamford, Michael Packs, several K9 police officers, the media, animal lovers, and the friends and families of hospital staff. 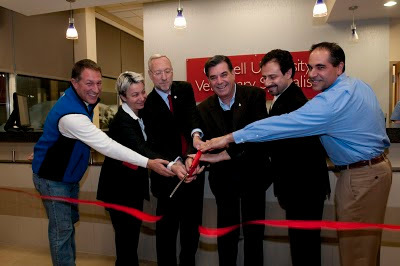 From left to right: Carl Kuehner from BLT; Dr. Susan Hackner, CMO of CUVS; Dr. Michael Kotlikoff, Dean of the College of Veterinary Medicine of Cornell University; Stamford Mayor Michael Pavia; Daniel Gurvich, CFO of CUVS; and Paul Kuehner of BLT. As the largest university-affiliated veterinary referral center in the country, CUVS is driven by the mission of bringing together the best of specialty private practice with the best of academia to benefit pets, the people who love them, and the veterinary profession. CUVS provides exceptional medical care by integrating the latest medical and scientific advances with personalized, collaborative and efficient service. With a state-of-the-art facility and a convenient location close to I-95, downtown Stamford and the Stamford train station, CUVS promises to deliver the highest level of specialty care to animals in need. 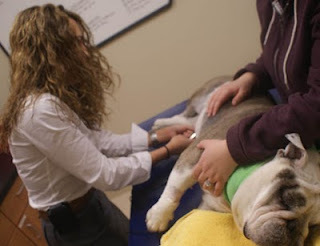 CUVS features an 24-hour emergency department serving walk-in animal emergencies all day and night. Referral-based appointments with specialty veterinarians are available in the following departments: Cardiology, Critical Care, Diagnostic Imaging, Internal Medicine, Interventional Radiology, Oncology, Orthopedic Surgery and Soft Tissue Surgery. Driving directions to CUVS are available here or by calling (203) 595-2777. You may email Client Services at info@cuvs.org, follow CUVS on Twitter and "like" our page on Facebook.